You are here: Home / Ethnic Groups / The People of Sumatra / Who are the Bengkulu? The Bengkulu people live in the city of Bengkulu, the capital of the province of Bengkulu in the southwestern part of Sumatra. More Bengkulu live in the city than in the villages. The Bengkulu come from the union of multiple ethnic groups who have migrated to the area, including the Malay, Acehnese, and Javanese. Bengkulu Malay is part of the Malay language cluster. Historically, the name Bengkulu testifies to a great military victory where their ancestors successfully expelled a superior military force of Acehnese invaders. 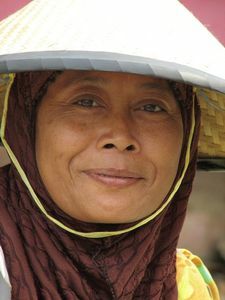 The Bengkulu generally work as store clerks, ship builders, mechanics, construction contractors, and government workers. There are now fewer Bengkulu people than immigrants living in the city of Bengkulu. It is actually hard to meet a Bengkulu person there. The Bengkulu line of descent is traced through both parents. The most important family unit is the extended family. It is composed of those related to the grandparents, including grandfather, grandmother, mother and father, sisters and brothers, children and grandchildren. Family members are responsible for each other’s activities, which binds them together. Every extended family has a respected and esteemed leader who is called ninik mamak. All of the ninik mamak from the extended families form a council to lead the Bengkulu community. Another influential group is made up of the clan’s intellectuals and high ranking government officials. If there is conflict, they try to resolve it by seeking consensus through discussion. In general, the Bengkulu live in wooden homes raised on stilts. The houses are painted and decorated with special Bengkulu motifs. The staircase is in the front of the house and the vacant space under the house is usually enclosed. Their arts are very similar to those found in other Malay groups. For instance, the Bengkulu Malay perform the randai dance, the plate dance, and the handkerchief dance. Most Bengkulu are Muslim. However, they still hold certain traditional ceremonies and rituals according to their older animistic beliefs. These animistic ceremonies are focused on seeking protection from spirits by defeating them and driving them out, both good and evil spirits. They hold a ceremony at harvest time called Tabot, held from the first to the tenth day of the first month of the Muslim calendar called Muharam. This festival is held to pay respect to the Sea Dragon so that the fisherman will not suffer misfortune while at sea. The Bengkulu need better technology and increased investment to better manage their fishing and boat making. Malaria is still a great problem as well. They need better knowledge on how to better build and maintain their homes so that they can endure the harsh coastal storms.